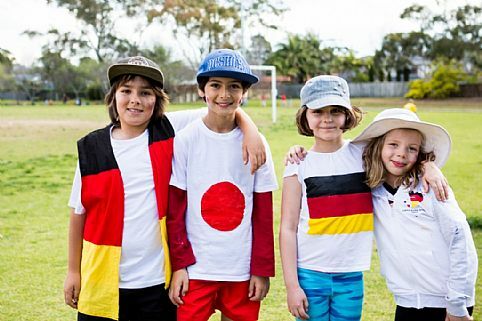 The German International School Sydney is located in beautiful Terrey Hills on Sydney’s Northern Beaches. Students from three to eighteen years old attend our school from Kindergarten through to the Year 12 International Baccalaureate (IB). All of our students have different personalities with diverse interests and individual pathways. They come from many different countries and speak either German or English or even both. They are part of a school community that not only carries but also inspires them. Our pedagogical vision is to teach each child the values and competencies to face the challenges and changes in tomorrow’s world, and to lead a fulfilled life. We therefore work with a consistently bilingual, international, highly differentiated syllabus where the best pedagogical approaches are combined, where both the Australian and European cultures come together, and where we commit to the highest standard of quality. We offer an environment in which our students are accepted and encouraged, where Mathematics, Science and Technology play a major role, but where there is also enough space to develop sports, musical and artistic talents, and individual interests. Many of our students are local. Even without prior knowledge of German, they are welcome to enrol in our school at any year level. We are a recognised NSW independent school which leads our students to achieve the IB, a world-renowned school qualification that enables and qualifies our students to study at the best universities worldwide, including Germany and Australia. GISS offers the highest quality co-education in a continuous bilingual and multicultural environment, and is dedicated to developing each individual student's full potential. We are committed to the best of German, European and Australian educational and cultural values fostered in a friendly and caring community. We challenge our students to develop into responsible, reliable, competent and confident adults. We celebrate different cultures, opinions and standpoints. We guide our students to appreciate openness, honesty and respect. We aim for the highest educational quality standards. We foster an atmosphere of peace and understanding amongst all of us. We care for our students and provide a nurturing environment.